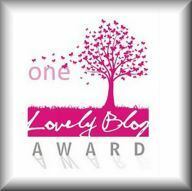 I am extremely flattered and excited that Miss Erin Terese has been nominated for the One Lovely Blog Award! A big, huge thanks to Lu at LuSays for following and nominating this blog for the award. Lu, I find your blog to be so very candid and lovely, and am so thrilled you find mine to be lovely also. 2) I am turning 30 in a few months and could not be happier about it. Each day I become happier, more peaceful, more patient and more kind. How could I not embrace my age? I love it. 3) I love trying new things. Trapeze class? Sky diving? Yoga? Painting? Cooking? Count me in! 4) As much as I enjoy writing, sharing my stories and babbling on about my thoughts and ideas, I much prefer to hear other people speak. Listening to others gives me profound joy. 5) I cry a lot. Growing up I always thought my mom was ridiculous for crying at Hallmark commercials and in church. I get it now. I no longer restrain myself. 6) I have been a Pescetarian for the last 16 years and eat mostly organic. I believe whole natural foods are vital to our health and much more healing than most people realize. 7) I would love to live in Spain someday. Life there is just beautiful. There is such an appreciation for life, food, family and culture. I must go back! Thank you for following and for sharing your thoughts! Congratulations on your award and thanks very much for the nomination!